Are we going to get warm again soon? All January I kept saying “it sure has been one of the warmest Januarys I can remember”. Boy, did that ever change overnight! So, with snow all around, it’s a bit strange to be writing about boating, but here goes. Hopefully, the crew in Wenatchee is enjoying the conditions. The Snowbird Race for Saturday the 9th was, of course, cancelled due to weather – although the diehards would probably insist it was only due to problems with getting to Shilshole, not the sailing. You may recall that one of the goals or focus items I put out to this year’s Board is to “ensure the financial viability of our Club.” Managing the Club’s finances and budget is one of the key responsibilities of the Board. One of my concerns in that arena has been a decline in our Cash Position. In fact, our Treasurer has calculated over the past six years we’ve had a net decline in our checking account balance of $670/year on average. We’ve gone from a typical bank account balance in the 11k to 12k range to a current 8k to 9k. This is a trend we need to stop or even reverse. At the annual Board Budget Meeting (first meeting of the year in January), the Board again looked for ways to trim expenses, but we’ve also had to accept various costs that have increased, over which we have no real control. An example is the fee for our Club mailbox, which has increased by more than $100 going into 2019. Other costs out of our direct control have also increased in the past few years. These changes, in order to be finalized, require a 10-day notification to the overall Club Membership (per Article IX of the By-Laws, page 31 in your 2019 Club Roster.) Therefore, we are hereby notifying all Club members of this proposed change by this article in the Rudderpost. If you have questions or wish to voice a concern about this proposed change, please reach out to any of us on the Board. Our expectation is to have a second and final vote to approve these changes at the March Board Meeting. With these Snow Days keeping us mostly at home and relaxing, it’s a perfect time to look at the Club’s upcoming Cruise Calendar and make some plans. We’re going to make every effort to attend more of the functions this year. We’ve got some projects underway on the boat right now, and we’ve got our trusty Chicken friend ready for spreader-level look-out duty at a moment’s notice. I hope everyone fares well through this Winter blast. We’ll hope to see you soon at an upcoming Dinner Meeting or Cruise Event! Dinner Meeting by AJ Mallory. Reminder, we have two NEW menu choices, thanks to the team at IVAR’s Salmon House (see below). Steve Mitchell runs the blog, SailBits.com. Come hear him talk about electrical systems and technology on boats. REMEMBER: Please use the Comments box in your RSVP on Evite to advise how many people and which dinner menu choice each would like. Steve grew up on a Christmas Tree Farm and spent the majority of his childhood outdoors, learning everything from construction to engines to electrical design from his father. He also started playing piano at age three, and went on to participate in a number of musical groups up through college, which he attended as a Music major. Boating and the water have always been a big part of Steve’s life, having grown up in Gig Harbor, near the waters of Puget Sound, about an hour south of Seattle. His first experiences on the water centered around small Sunfish and Lasers, all sailed on nearby lakes. In later years, most spare time was spent on the waters of nearby Fox Island, Wollochet Bay, and Gig Harbor on anything that floated. Along the way, Steve developed a deep love for computers and technical engineering. He built and ran one of the largest bulletin board systems (BBS) on the west coast, and participated in some of the first parts of the Internet in its infancy. 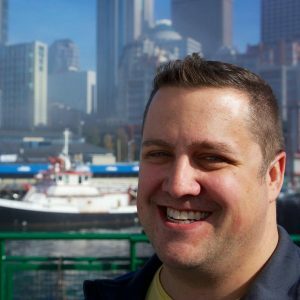 He dove head first into systems and network administration, and started working for various companies in the Seattle/Tacoma area. These included National Distributing, Sagem Morpho, Simpson Tacoma Kraft, WON.net, Sierra Entertainment and more. For the last 20 years, Steve has been employed at F5 Networks, an industry leader of network and security products based in Seattle, WA. His focus has been on technical engineering, complex testing and development. He also designed and built the most progressive customer engagement spaces and cutting edge data centers for the company around the world in Seattle, London, New York and San Jose. Steve’s love of the water never left, and having had the opportunity to work for so many great companies and travel the world, he was able to experience new ways and places of being on the water. However, he always loved coming home to the waters of Puget Sound. Through the 1990’s and 2000’s Steve owned almost exclusively sailboats, including a 48′ Hunter, 34′ Beneteau, 29′ US Yachts, 26′ Clipper Marine, 30′ Catalina and a number of sailing dinghies. He plied the waters of Puget Sound, now called the Salish Sea, and Canadian waters up to Desolation Sound and further. In the mid 1990’s, Steve started to combine his love of networking with boating, and built systems to gather performance and monitoring data on board his boats. Data collection and organization has always been a passion, and various systems and projects came and went trying to provide a centralized way to see your boat data. SailBits (then called SteveM.net) was born in 1997 when Steve started documenting his experiences with these networks and projects. In the early 2000’s he also tried power boating for a while, and enjoyed parts of it, but was still not done with sailing. Further developments in cheaper cellular access, NMEA 2000, and WiFi helped Steve’s love of data and networking on a boat become more of a reality. He participates actively in SignalK and canboat open source projects, as well as many other forums and groups where networking your boat has gotten to serious levels. 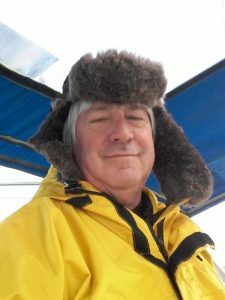 In 2010, SailBits started garnering wider attention, and allowed Steve to write for publications such as Panbo, Three Sheets Northwest and other boating publications in the past few years. Steve’s last two boats contained over 100 different networked devices, had completely reworked electrical systems which provided amazing amounts of information and generally were technical showcases. Much of the experience he learned from his civil engineer father helped to be a DIYer when it comes to pretty much any project on the boat. In late 2018 Steve decided to move to power boating again and is looking forward to the extra room and power to be able to continue his testing and love affair with technology on the boat. He can also now include a decent sized piano on board, which he still plays and actively composes new songs on. Special dietary needs can be accommodated; please let me know on your Evite RSVP. Main course selections are due by 9:00pm on Friday, February 15. Look for your Evite invitation in your email, then hit reply and use the comments field to tell me how many in your party and their dinner selections. Cancellations must be made by 9:00pm February 15. Mark your calendars for these cruise weekends as they are all not to miss events. The Wintery Wenatchee event is being hosted by Mike Thompson, and Bonnie Murray. The fun filled weekend will be past when this article is printed, so hope you did not miss it. March 1 – 3. The Bell Harbor Cruise, downtown Seattle, Bell Harbor Marina. (206 878 3951), contact bhm@portseattle.org. This is an excellent opportunity to enjoy the culture and shopping of downtown Seattle, all within easy walking distance of the marina. Saturday evening dinner will be held at Anthony’s again this year. Now is the time to confirm your boat reservations for the marina, as this must be done before February 16. After that, the marina releases the SBYC reservations to first come, first served. Please let me know if there are problems with making reservations. Also, let me know if you are coming, sans boat, to the dinner on Saturday, so I can make reservations for that too. April 19 – 21 Yellow Fest, at Blake Island. This weekend gives boaters a chance to enjoy the Pacific NW outdoors away from the city, no cars, sirens, or crowds, all within 90 minutes by boat. Jessie Lundin will be hostess this year for the ‘Easter Egg’ hunt. Bring firewood and small bottles of liquor for the hunt. SBYC has rented the pavilion for Saturday evening, and boaters will bring a potluck dish to share. No marina reservations are required for the docks, so getting there as early as possible helps to secure dock space. May 17 – 19 Burger Burn, at Brownsville Marina. The cruise will be to Brownsville Marina this year, under the pavilion, a wonderful place to have a barbecue protected from the spring rains. Grills are available for cooking. A croquet game is planned for non-competitive cruisers to renew their coordination skills. Just kidding about the non-competitive; I challenge anyone to beat me. No prizes offered, just personal satisfaction. Marina reservations have been made, however, it is necessary to confirm one for your boat. Please let me know if there are any problems. June 14 – 16 June Dinner Dance at Kingston Cove Club House. The dance is on the third weekend of June, because of conflicts with race events on the second weekend. The dance will be a lot of fun, as the band, Malo Castro and his players, are terrific musicians, performing upbeat and dance-able music. Last year they had everyone dancing by the end of the evening. The Kingston Ale House will cater the entree; SYBYC is planning hors d’oeuvres, dessert, and of course, wine. Confirm your boat reservations at the marina. SBYC has reserved 10 for now, and let me know if there are any problems. More to come; I hope to see you on the water this year. Cruise Chair, cruisechair@shilsholebayyachtclub.org, or Patricia, 206 356 3217. At the January Dinner Meeting, we began distribution of the 2019 Roster to members. Join us for the Dinner and/or Happy Hour at Ivar’s on February 19 if you didn’t pick up your two copies. If you cannot join us at Ivar’s February 19, watch for your Rosters by mail March 1. IMPORTANT: website URL is ShilsholeBayYachtClub.org. There are other versions in the 2019 Roster, which will continue to be forwarded to ShilsholeBayYachtClub.org, for this year only. For email addresses of your officers, go to ShilsholeBayYachtClub.org – THE CLUB – OFFICERS. Changes? Corrections? It is easiest to send your change of address, phone, boat name, spelling correction, etc. when it happens. You may send to me, Rubie Johnson. I’ll add the changes to the Roster file, and pass it along to the Webmaster, Rear Commodore, and Vice Commodore. See my contact info in the Roster, or send to Webmaster@ShilsholeBayYachtClub.org. Request for a Volunteer by The Rudderpost Editor. I am looking for a volunteer to be a backup for me on the few times that I am unavailable to put the Rudderpost together. Sometimes vacation to foreign lands gets in the way of performing my duties as editor! Either AJ Mallory or I can assist in showing you how to use the software (it’s quite easy, but that’s what they all say!) But it really is, honestly. So if you’d like to volunteer to help put the Rudderpost together ostensibly only once a year when I’m out of town, then please send me an email – I’m in the directory – or give me a call.